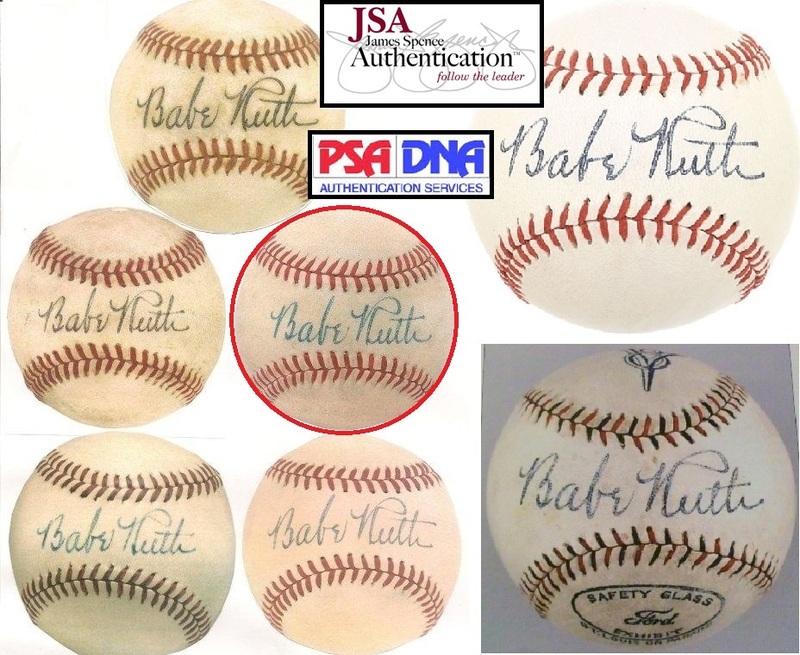 Hobbyists and autograph experts have for years alleged that the proliferation of Babe Ruth forgeries in the marketplace has been bolstered by the shoddy work of the authentication companies PSA/DNA and JSA. In the six previous installments of our “Operation Bambino” investigation, Hauls of Shame has illustrated how both companies have authenticated perhaps millions of dollars in fake Ruth signatures for decades. 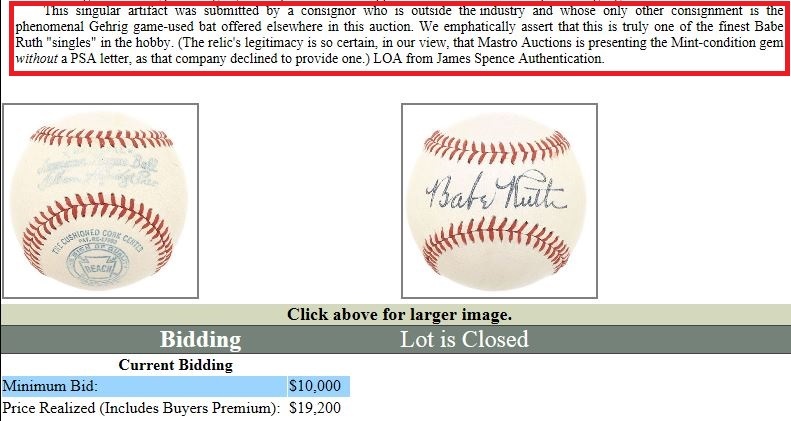 Now, in Lelands current auction we have identified yet another bogus Ruth that further exposes an entire group of big ticket single-signed baseballs as forgeries created by what several experts believe is the same forger. When Hauls of Shame informed Lelands of the possible fake and showed the auction house four other Ruth forgeries almost identical to their offered lot, the auction house pulled the alleged treasure from its sale. In part 2 of our special investigation we identified several different handwriting styles of forgers creating bogus Ruth single-signed baseballs and one of those styles was identified by illustrating different baseball that had sold in Mastro, REA and Grey Flannel auctions. One of the balls identified by us ended up in Lelands current sale and when compared to the other similar baseballs it is clear that both PSA/DNA and JSA have been authenticating forgeries of Ruth signatures that have fetched anywhere between $20,000 and $300,000 at auction. This style Babe Ruth forgery appears on at least seven big-ticket auction lots that have been sold with either JSA or PSA/DNA letters of authenticity. The ball pulled from the Lelands sale appears highlighted in red. Representatives from Lelands agreed with our determination and proceeded to remove the alleged forgery from the current sale. 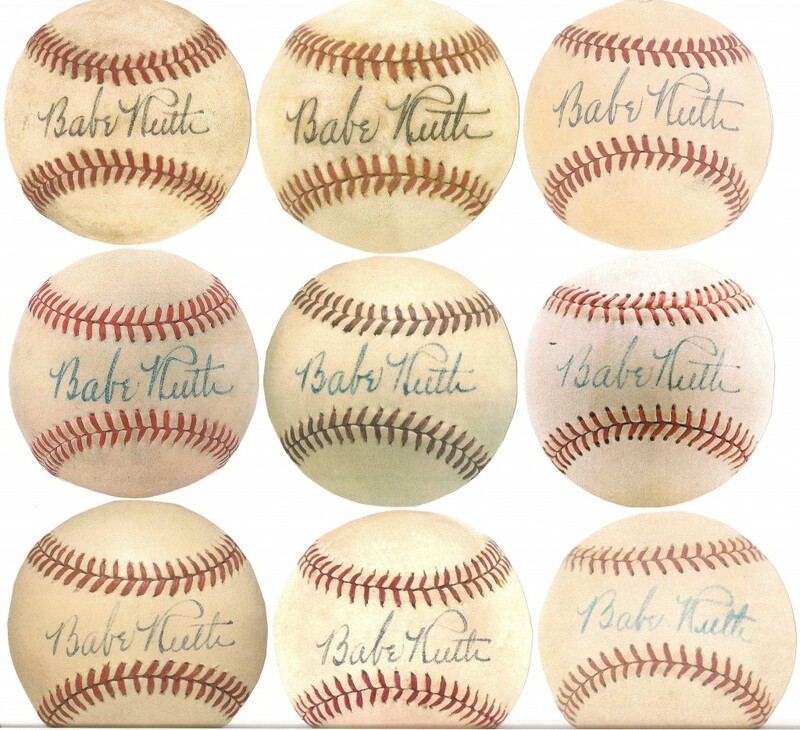 Our second installment of the “Operation Bambino” series had already identified these balls as forgeries in a distinctive handwriting style of a specific forger that contrasted two other styles of Ruth forgeries. Even when viewed by hobbyists without any background in handwriting analysis it is quite evident that these style signatures are highly problematic. This group photo appeared in our second part of the Operation Bambino series and identified each of these baseballs as Ruth forgeries. The ball pulled from the Lelands sale appears on the left side of the middle row. The bogus ball was authenticated, however, by James Spence Authentication (JSA). This Ruth forgery was sold by Mastro in 2008 with an LOA from JSA. PSA/DNA declined to authenticate the ball at the time, thus suggesting that PSA may have known these balls were forgeries as early as 2008. The "mint" ball sold for just under $20,000 in the Mastro sale. We asked Lelands, “Have they (PSA/DNA) been aware these are fake since at least 2008? Please ask, because they surely won’t give answers to me or any customers of theirs.” Mike Hefner of Lelands responded saying, “I have not spoken with Steve Grad for over a year.” Leland’s founder Josh Evans thanked us for informing him about the fake and said, “We are pulling it.” Lelands could not divulge who the unlucky consignor/victim is. 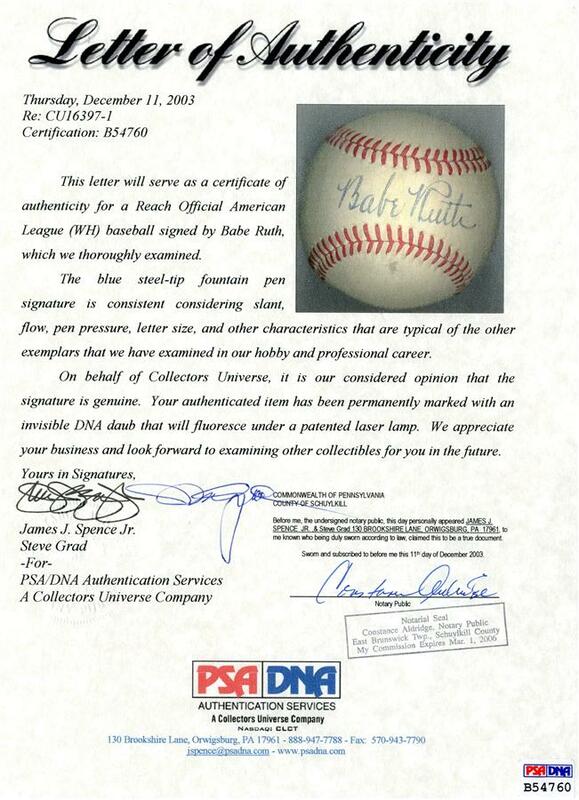 This is the PSA/DNA LOA that accompanies the forged Babe Ruth baseball appearing in Lelands current auction catalog. The LOA was signed by both James Spence and Steve Grad. Experts allege that this group of Ruth "blazers" is full of fakes and forgeries. These balls have broken auction sales records and have all been authenticated by PSA and JSA. These balls, when compared to the forgery pulled from Lelands, illustrate the handwriting of an additional forger who is fleecing collectors. As illustrated by our previous Bambino reports many of the record-breaking Ruth balls that have sold for several hundred thousand dollars have been forged in a hand different than the ball pulled from Lelands. Each of these Ruth forgeries was executed in a distinct and contrasting hand, different than Ruth, himself, and also different than the other multiple forgers. Linda Ruth-Tosetti (left) has strong words for PSA President Joe Orlando and his senior authenticator Steve Grad (second from right). James Spence of JSA (far right) authenticated the fake Ruth ball withdrawn from the current Lelands sale. Neither PSA or JSA have ever responded to Hauls of Shame’s inquiries about forgeries their so-called “experts” have certified authentic. The one time PSA did respond to HOS was in 2013 with a letter from attorney Keith Attlesey threatening a lawsuit for a report we published stating that the company was “founded on a fraud.” Our statement, however, was based upon the fact that the first baseball card they graded (the Gretzky-McNall T-206 Wagner) had been trimmed by auctioneer Bill Mastro and that the PSA employee grading the card, Bill Hughes, knew it had been trimmed. Shortly after Attlsey sent us his cease and desist letter, Mastro admitted to fraudulently trimming the now infamous T-206 Honus Wagner card as part of a plea agreement with the government. It should be noted that while PSAs card division was, in fact, founded on a fraud, its autograph division was also founded on a similar fraud based upon the company’s authentications of gem-mint Ruth single-singed balls that are considered forgeries by many experts in the field. Sources we spoke with could not confirm whether the FBI is currently investigating PSA and JSA for their ties to fraudulent Babe Ruth memorabilia. As a former sports memorabilia dealer, I have been telling people for years that these so called experts couldn’t tell the difference between authentic and forgery. Balls I had signed in the presence of the player were deemed fake by these so called experts. No matter the pictures had sitting next to the player with item in hand. These jerks have damaged the collectible market more than helping it, and is why I don’t deal with it anymore. finishes hitting the fan-which it WILL eventually, and then…LOOK OUT as Auction Houses begin folding under the strain at being caught believing these jokers. Thanks Peter, having been behind the counter from 1987-2004 at several collectibles shops, (we didn’t sell autographs at most) I’m wondering if I’ve trained my eye to believe the fakes? Who is reputable, who is a trusted source in the industry, for a “second” eye? Obviously there is a huge demand for authentic Ruth signatures. Who should be trusted? I would’ve given the “okay” to most of them and would have been mistaken….who would you use? This is yuge. This is why America needs my help. Corruption is exploiting the good people of America. At least in a casino they have a fair chance of getting their money back. Owners of these bad balls will never see a dime of their money returned. Yuge. Take that James Spence. You are going to get what you deserve. You have been backing losers for far too long. You and your staff have authenticated fakes and failed GENUINE autographs for years. Hope you like your cell!! As for the PAWN STARS, you best start using an honest Authentication service. JSA and PSA have taken the money of many collectors for years and have NOT always delivered a honest “Opinion.” It is TIME to change the landscape in this industry. We had 14 Mike Trout autographed baseballs that were authenticated by Global Authentics. The were given to Spence for authentication by JSA. He told us by phone that 10 (lie) of his authenticator’s looked at the autographs and NONE of them could confirm or fail any of the signatures. BS!! First of all, we know that he would not pass 14 balls around to 10 of his staff for authentication. Secondly, it would be impossible that ALL the signatures could not be determined fake or real. The real reason he failed them is because they had GA stickers on them. GA, who once had some problems of their own, now is probably the most trusted 3rd party authenticator in the industry. Steve Sipe knows the business better than all the staff’s of both JSA and PSA put together. Have not used JSA since that incident. Would recommend all my collector friends to try using Global Authentics. They are located in Carlsbad California and can be trusted to provide reliable and trusted service. Just more smoking gun proof that PSA and JSA are crooked and inept. Kudos to lelands for pulling it but what a shame their consignor is taking a 40k hit. Or will he just try to sell it to some other sucker. Will Clueless Joe Orlando write him a refund check? Or will Billy Mastro have his Father Flanagan pick up a refund check for the guy at the penetentiary? What a house of cards this TPA biz is. Authentication is not a perfect science and never has been. No one should ever expect the opinions of informed authenticators to be gospel. After 45 years of looking at autographs I always confer with at least 2 additional colleagues to try and form a collaborated opinion. As good as the technology gets for the authenticators it is, also, being used by the forgers. Your paper currency should be a good indicator of this. How many times has the government in the last 20 years had to change it’s paper currency to keep up with the counterfeiters? Follow this simple rule to increase your chances of getting a real autograph; purchase from dealers who have a solid reputation and if you are purchasing from a collector that you do not know bring it to a minimum of 2 dealers you trust. if you can get 3 or 4 to add to the opinion the better. Just within the past 2 weeks a collector from Texas sent me 2 Ruths, a Moe Berg, and a Gehrig bought at 4 separate transactions. All 4 were not good and he was out $8,000. Stop blaming the authenticators as they are human and are trying to help the hobby buy with confidence. Be diligent yourself. It’s not going to get better. It’s just going to get worse. I have two fake Mickey Mantle 1952 topps rookies that are in PSA holders. these case can be popped open and fake cards inserted. Even the red tags on top are counterfeit. I called PSA before I made the purchase to see if the cards might have been reported stolen. Never imagined crooks could put fake cards in PSA cases and you don’t here about it. PSA told me to make sure the serial numbers match up. The crooks use the serial numbers from the PSA website. PSA has not informed collectors about the scam. The crooks are starting to get arrested after selling many of these fakes. My seller was arested in Ohio a few years ago. He is currently incarcerated. I will never see a cent of the 12 k. I blame PSA as much as the guy in jail. They could have tipped me off when I called them. Think about it. How can you buy anything that has JSA or PSA attached to it. I mean anything at all. From a minor star all the way thru Mantle, Ted Williams to Ruth. You can’t trust anything. So I just quit buying anything. I know I can’t take a big hit on an item if I buy it and it is deemed fake. You would think eventually collectors will just quit buying all together. Among my circle of friends it has been happening for many years. This will not make it any better. I believe in Karma and they will get their just due. Can’t come soon enough. Mike you can blame the authenticators if they are putting crap out into the market that they know for 100% certain is fake. They are paid BIG bucks to put their stamp on items they know are no good. I can’t believe you can’t follow this. Purchased a Ruth/Gehrig ball at last REA auction. It came with a JSA letter. Well, since the purchase i sent the ball to Global and they gave it thumbs up. Still wanted PSA to authenticate it as well. Took it to them and it came back good as well. I guess these days the more letters the better. Great read, and thank you for sharing. I saw that Leon Luckey, the convicted drug dealing fraudster, made a nasty comment about Pete Nash on Net 54. For a guy who lied publicly about his Peck & Snyder card by saying that an FBI agent did not tell him that the card was stolen (it was) and who prostituted his daughter out in a Heritage catalog so that he could pretend he was selling his collection for her college education (it was a fraction of the proceeds), perhaps he shouldn’t be the determining factor as to who is a crook and who isn’t? Everyone knows what a scumbag he is and I at least appreciate that he can’t ban anyone over here. Because if people could tell the truth about him on Net 54 he would be humiliated on a daily basis. I wonder what coach in his corner Ruth certs are going for? PSA certs Frank Lucas signed plastic guns. I think Mastro will have company when the F.B.I. rolls out another operation crushed. If I were to buy a ball, I would have it taken to a forensic handwriting expert, where their word holds up in a court of law. This PSA/DNA has been bogus from the start! Just another money making scam in my opinion, which you have stated in your article very nicely. Keep up the good work Hauls of Shame! I will tell you, MY signature has been forged! How ridculous can you get! Interesting sleuthing Hauls of Shame! One can only ask themselves why/how an authenticator (Grad) can afford to drive a Bentley automobile as well as other high end cars on the wages of an authenticator? I guess the old saying “follow the money trail” might need to be applied if investigators are actually doing something about this situation. With all the other prior examples your site has given one would assume that something is being done about this obvious scam. Just a matter of time, hopefully. The problem is that there is no way for these balls to be destroyed once they have been determined to be fake. They just pop up in another auction with a different company at another point in time. So Lelands pulled the ball good. The owner of the ball is just going to take it elsewhere. No one wants to get left holding the bag and I get that but these things are basically just hot potatoes. This is where the Feds need to get involved. Once the ball was pulled, they should step in and destroy the ball. Sorry Mr Consignor but it’s for the greater good. Coach had $211 balls for years, Beatles for $311. That comment above about GA (Global Authentics) being the most trusted TPA in the industry is ridiculous! Sorry, ?Denzel, but do you work for GA or know somebody who does? Have you even seen some of the outrageously obvious fake stuff that they have authenticated? I’d stay away from anything that has a GA sticker on it…far away! Denzel ought to go on Autographlive and mention GA. Grab a case of TP for the ride….their stuff rivals Coach in his corner or Fryingpan certs. Autograph authencation is so hard. Their is to much human error. I don’t trust any TPA. You have to do your own research. Forensic hand writing experts are as bad as TPA’s. Look at GFA authencation on Ebay all of there Mickey Mantle, Roger Marris, and Ted Williams autographs are fake. There has to be another operation bull pen for this greed to stop. Why hasn’t the FBI put Coaches Corner Auctions out of business? Christopher Morales is there head Authenicator and he is a forensic hand writing expert. Can somebody post what A real Babe Ruth auto looks like. Why does Pawn Stars and Rick Harrison continue to bring this clown Steve Grad on the show? It makes no sense. With the clear evidence against this guy, Rick and Co. need to move on and find someone new to authenticate their items. Thank you Peter for continuing your great coverage of this market and the cons that are out there. Be well and Happy New Year! They’ll be another Operation Bullpen but too many agents are assigned to the SoCal field office on the terrorism threat to Las Vegas. Coach,Morales,GA…..thousands of fakeroos out there. Anybody think Epperson will lose in the big lawsuit verdict down the road? Can you show an example of a real one for comparsin i have a couple and woulf like to have better idea real or not. Thank you Peter Nash! I see a lot of talk in the hobby, but very few people are publically doing something about the fraud! I’d like to see soeone investigate the card doctors that have most likely submitted hundreds of thousands of cards to PSA. I have a very very hard time believing PSA is unaware of what is going on and who is doing the doctoring. Great, detailed article on these weak forgeries that slipped through 10-15 years ago. Very disappointed in Mike Heffner though letting Lot 374 even make it to the printed catalog. Most times, Heffner really seems to know what he’s doing. Oh well, even “experts” such as Heff make mistakes from time to time. Good thing Chief Ironside (Joshua Leland Evans) has him by his side to plug in his motorized scooter when the batteries get low. Get well soon Senor Josh !!!! I also collected and dealt in memorabilia from the late 1970s thru the early 1990s. I can verify that you seldom saw Ruth autographs in this era – when you did it was either a beat-up ball or a cut signature/index card. It was NEVER one of these “blazers” – a mint-condition, single-signed ball or photo. 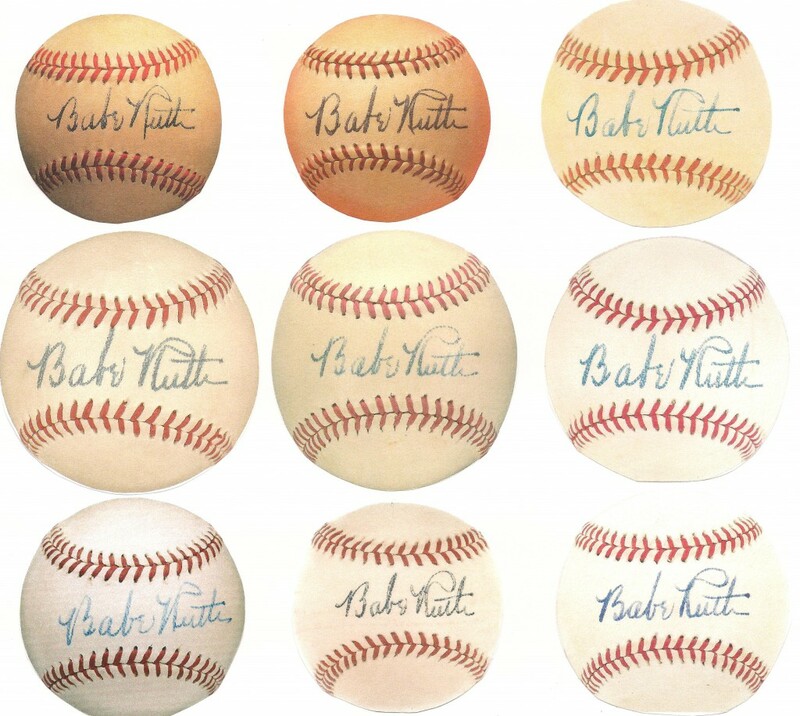 The number of Ruth autographs has to have doubled or tripled over the past 20 years – either they are mostly fake, or Babe Ruth has come back to life, or they were hidden in some secret temperature-controlled warehouse for 50+ years. Soon it will come to the point where there will be so many fake Ruth (and Gehrig and a few others) signatures out there that it will be tough to tell what is real any more. I advise people now to stay away from buying any Ruth or Gehrig for fear of getting a fake. Some of the other examples of forgeries that fooled the cert companies shown on this site have been jokes – Ty Cobb, Christy Matthewson, etc. But these Ruth forgeries are pretty good, done by someone who know what he is doing. The flip side of the cert companies not knowing what they are doing is when they turn down good signatures – for example, I have a Ruth ball I purchased in the 1980s that I think is good, but PSA says isn’t. It is typical brown/beat-up condition of a 80-year-old ball stored in a dresser drawer for most of its life. As for where to find exemplars of real HOF autographs: go to Amazon and buy the book by Ron Keurajian. You will learn more from this book in an hour than many people learn in a lifetime. One more thing: why not name the names of the forgers? I am sure people on this site or Net54 know who they are. I went to NYC shows in the 70’s, I rarely saw any Ruth signed ball, most were team signed and all yellow. These things are like 2015 signed on new balls. Great, man wanted over a fake autograph. How about this s–t? And who says Global is great? Only Global. This is all so sad for the hobby. It was once a great hobby, now ruined by scum and a government that doesn’t deem it a serious issue at all. They all need to crack down on this Product called Super Break Sports Deluxe Layton Sports Exclusive, a lot of fake stuff coming out of this product- A fake Babe Ruth signed photo recently sold on e-bay that had two certification numbers, one by spence and one by psa/dna, that didnt match, also a fake kobe bryant signed gu jersey with fake documentation from jame spence and grey flannel, a fake Jordan signed jersey with 3 documents, 3 certification numbers, didnt match auction house grey flannel, a fake Picasso pamphlet, fake political documents, historical documents and much more coming out of this product, being put out by super break and sold by layton sports, supposedly series three coming this week to layton sports with a price tag of $12.500.00 a box with four items each, someone needs to stop this scam!!! Can somebody post what is consideed an authentic example of Ruth autograph?